Dengue is an infection caused by a virus. You can get it if an infected mosquito bites you. Dengue does not spread from person to person. It is common in warm, wet areas of the world. Outbreaks occur in the rainy season. Dengue is rare in the United States. Symptoms include a high fever, headaches, joint and muscle pain, vomiting, and a rash. In some cases, dengue turns into dengue hemorrhagic fever, which causes bleeding from your nose, gums, or under your skin. It can also become dengue shock syndrome, which causes massive bleeding and shock. These forms of dengue are life-threatening. There is no specific treatment. Most people with dengue recover within 2 weeks. Until then, drinking lots of fluids, resting and taking non-aspirin fever-reducing medicines might help. 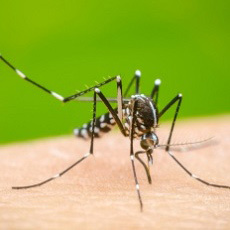 People with the more severe forms of dengue usually need to go to the hospital and get fluids. Article: Tickborne encephalitis and dengue Vaccines.